BRIGHTON, Mich., Feb. 14, 2012 – While on our daily commute, most of us encounter at least one nasty pothole, especially those who have to drive down Chilson and Brighton Lake Road. Aside from the initial jolt from hitting a pothole or the rumbling of driving over a “washboard” patch, the damage to your vehicle can really add up if you don’t properly maintain it. 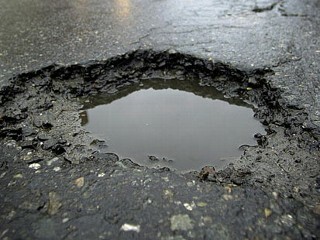 Potholes can even be deadly for motorcyclist and drivers traveling at excessive speeds. At Brighton Ford, we want to give you some advice for handling potholes and what you can do for you vehicle after hitting them to keep your vehicle in safe driving conditions. The first question we often hear is “What is the best way to deal with a pothole?” The answer is to avoid it completely. 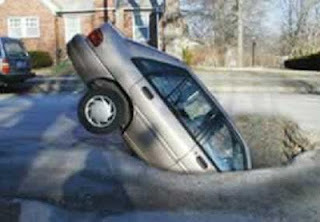 If you know there’s a big pothole on your daily commute, try finding an alternative route. We know that is easier said than done, but it is the only way to guarantee your vehicle be free of damage. If you have to drive over a pothole, the best way to go about it is to accelerate over it so the weight of the car is shifted to the rear. By hitting the breaks the entire weight of the car is shifted to the front and can result in more damage. Don’t get us wrong… We aren’t condoning speeding, but physics play a major role in your vehicle condition. By accelerating instead of breaking, you greatly reduce the chance of the damage being catastrophic. Another safety tip to keep your vehicle in shape on rough roads is to be aware of pooled water on the road. Not only can pooled water cause a potential hydroplaning situation, but they also can conceal large and dangerous potholes. Hitting potholes can potentially pop one of your tires and can also affect your vehicles alignment over time. Each time you run over a pothole in your vehicle, the wheels become less aligned. This can cause uneven wear on your tires and cost you extra money in tire replacements and repairs. If you find yourself running over potholes frequently, bring it in the Brighton Ford Quick Lane Service Center for a free vehicle inspection by one of our ASE certified technicians. They will check your alignment and check your tires for signs of damage and premature wear.